The 9915 was the rack-mountable, industrial-strength member of the 80 Series. The 9915 had the same features as the 83, excluding the screen and keyboard, but including the I/O ROM and Program Development ROM built in. 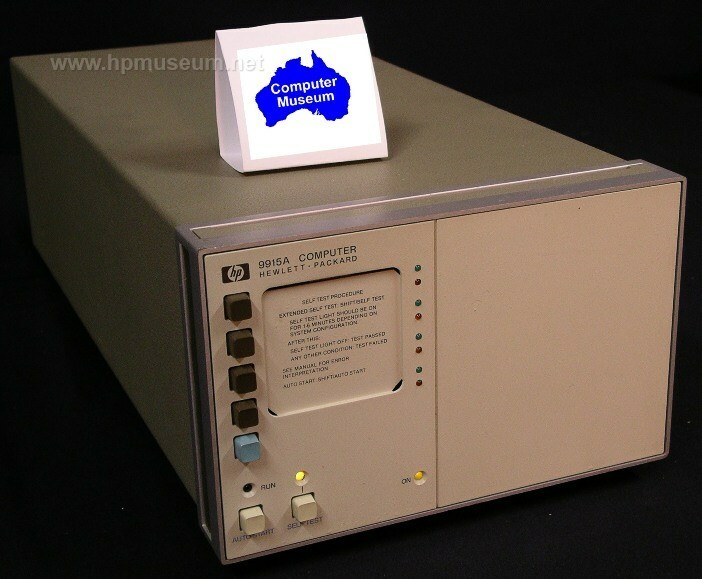 The 9915 was the lowest cost computer in the 80 Series. It was designed to be a production-only machine. Normally, application development was done on an 85, and the program transferred to the 9915 via tape or EPROM. The 9915 was the only member of the 80 Series to include a cooling fan. The differences between the 9915A and 9915B (1984) are the same as the 85A and 85B. Worldwide monthly sales of the 9915A peaked at 152 units in December of 1981. Like the other Series 80 machines, the 9915 is also very reliable. The primary challenge with this computer is finding a keyboard that will work. Many of these computers were never sold with keyboards. Program development was done on an 85 with the resulting boot program stored as AUTOST on a tape that was loaded into the 9915. The 9915 will not accept a keyboard for HP 262X terminals (which have nine-pin connectors rather than 25-pin connectors). Specifications for the keyboard connector can be found at http://www.hpmuseum.org/cgi-sys/cgiwrap/hpmuseum/archv014.cgi?read=60693 . The 9915 is the only Series 80 computer that has a cooling fan. 9915 LEDs will light up even if the fan is not working, but no video output is possible in this state. The fan is easily replaced. One of the 9915 machines in the museum had a "frozen" fan. The fan did not spin because the blades were contacting the fan housing. This problem was fixed by removing the fan from the housing and filing down each blade with a metal file. Fortunately, most of these mechanical problems can be fixed with a little grunt. Another quirk of the 9915 is that the expansion slots at the rear are recessed farther than the slots at the rear of the other Series 80 computers. In fact, the slots are so far recessed that some plug-in modules cannot be removed by hand once they are inserted. When inserting expansion modules into a 9915, be sure to use the top two slots only. An alan key gripped by pliers can be used to remove inserted expansion modules provided a free slot is available below the inserted module. The video output port on the 9915 will output to most composite video monitors (or to a regular VGA monitor, using a composite-to-VGA converter).